In the first chapter we looked at Plane, Type and Status. Today we are going to look at three very important factors of Size, Energy and Weight. 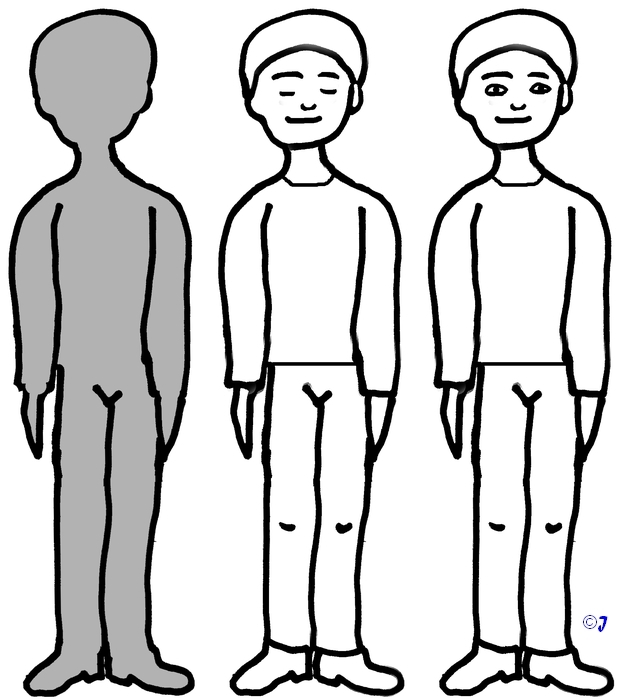 Know that the size factor of each of the three levels (physical, metaphysical and Spiritual) is different. 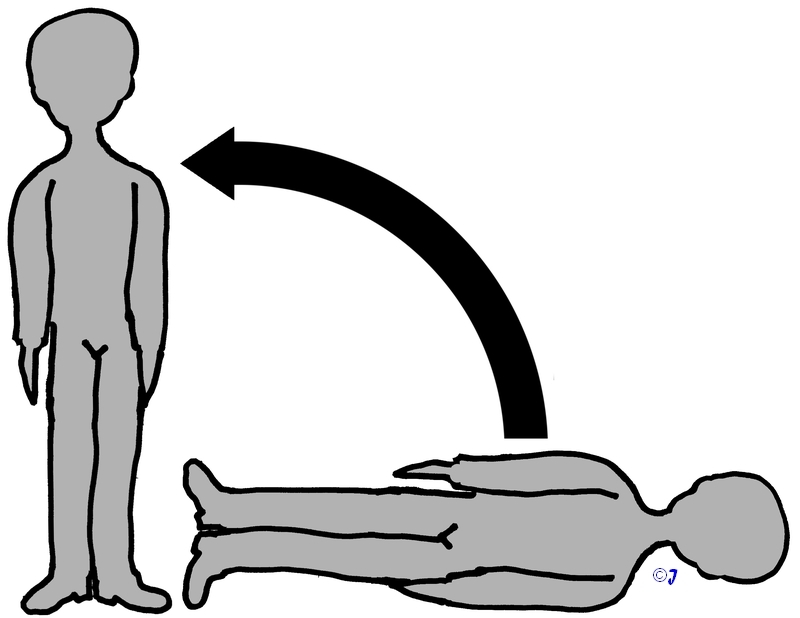 The physical level – the level we are literally born into – is a very tiny place (although it seems huge to the child!) 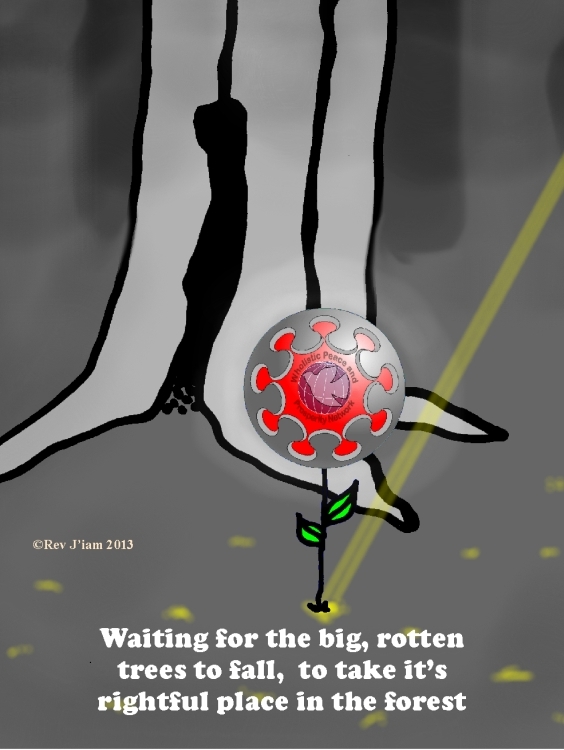 It is definitely finite in size. The next level up is the metaphysical, which is semi-infinite in scope. Whilst the body thinker is working in the bowels of the ship, the captain is working from the “bridge” where he can see miles out to sea! Know that about 20% of the world live in this level. These people work with sound, which is a lot faster and is the first level of real energy. People who work with sound are called “Auditories.” know that 100% of singers are auditories! Plus 99.99% of teachers are auditories too! Know the speed of a kinaesthetic is the speed of the body which is around 20mph whilst the speed of an auditory is the speed of sound, which is 770 mph (1,200 kilometres per hour). It is this difference in speed that allows the brain/ego to make 75% of money for rich people(not that you ever want to be rich!) The faster an object moves the greater it’s momentum capacity. The top level is the spiritual level. On this level our outlook is infinite. This is because the owner of the ship, whilst living on the actual ship itself, is not confined to the ship. At the back of the ship is a heli-pad with a helicopter the owner can just hop into and fly away! Just getting 100 metres above the ship extends his line of vision a long way! And a helicopter can fly up to the clouds, or above the clouds on a miserable day, into the sunshine! Of course when the ship eventually sinks the owner just gets into the helicopter and flies away to a new world. The captain “goes down with the ship” along with the crew and both are recycled back into the physical world. So the ship, crew and captain are recycled whilst the owner continues to live, because the soul is infinite! And that, in a nutshell, is our life! When our owner, the captain and the crew work together (cooperate) a lot more gets achieved. Did you know that the average cooperative business is twice as efficient as a capitalist business? The same goes for an internally cooperative person, as opposed to an internally divided person. But not just twice as efficient, many fold (exponential) more efficient! Unity is also known as “wholeness.” Wholeness in the Bible is known as Holy. Wholeness is Holy, Holy is wholeness, simple as that. Wholeness of self is important because it increases our power base whilst “lightening” us up. Have a look at the chart below. In the above chart we have two new factors – Energy and Weight. Weight can also be called frequency, but for spiritual purposes I prefer to call it weight, simply because it Acts like weight. The less weight we have to carry around, the easier life is! Imagine you had 100 tons of weight to move from point A to point B and only 1 horse power to achieve it? It wouldn’t be an easy job! This is the energy to weight ratio on the physical level. But say you have only 10 tons to move and 10 horse power? That is going to be a lot easier! This is the energy to weight ratio on the metaphysical level! And now look at the spiritual energy to weight ratio – there are zero (0) tons to move with100 horse power! This is the level of EM-powerment because we can move anything we want with our energy! Let’s just look at the energy column individually. If we work in the metaphysical world we work on an energy level of 10. Know that 20% of the world works of this “auditory” level. Of course they can easily achieve 10 times the results, because they are working with a base energy of 10. Some people on this level also work on both the metaphysical and physical levels thus ADDING their two energies together to achieve and energy level of 11! The next step is the spiritual level. Now there are many different levels in this realm. To begin with we will look at the very lowest level – the visual level. On the visual level 20% of the people are practising. All painters/artists are visuals (Sculptors are kineathetic/visual and others are auditory/visuals (like Len Lye.) 99% of artists are visuals. Know also that 99% of CEOs are visual. They have to be to see the “Big picture” of a corporation. All spiritual masters are also visuals – “Brother have you seen the light?” Lol! The CEOs work in an area just below the bottom line of the 100 box giving them perhaps an extra 15 points to total 16. Spiritual masters work in the full box (and above) giving them 111 – the full synergy of body, mind and soul. Anyone who asks and then puts in the work (discipline) can become a master of varying degrees. For the next step up in energy power we have to change the spiritual in the plane column to Soul so we can differentiate between human energy and spiritual energy. You will notice how there are often three levels in the wholistic world. This is a consistent pattern. It also Builds – 3, 6, 9, plus 11, 13 and 19. You will notice that the figures in the energy column are all Additive! 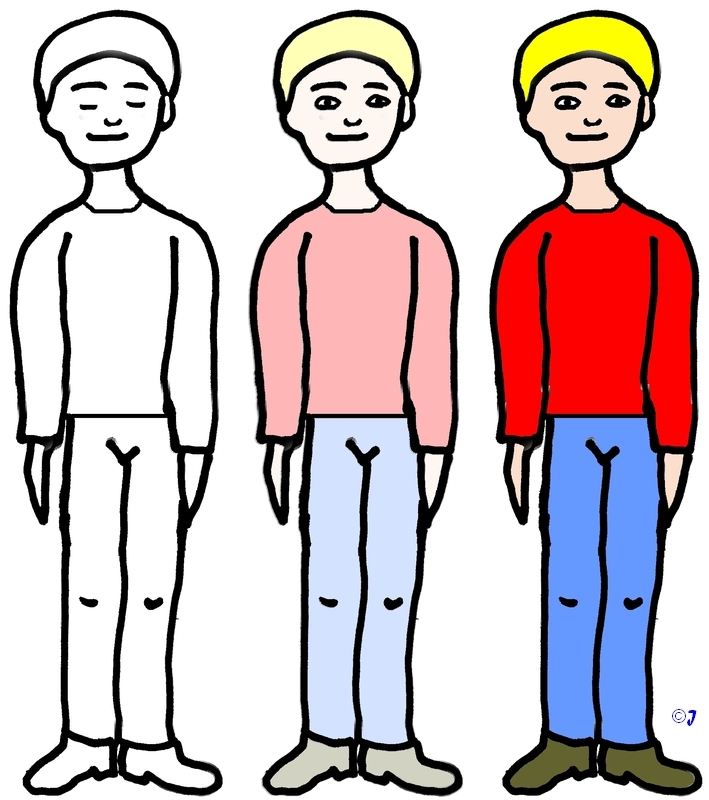 See also how there are three levels on the human level and three levels on the spiritual level. 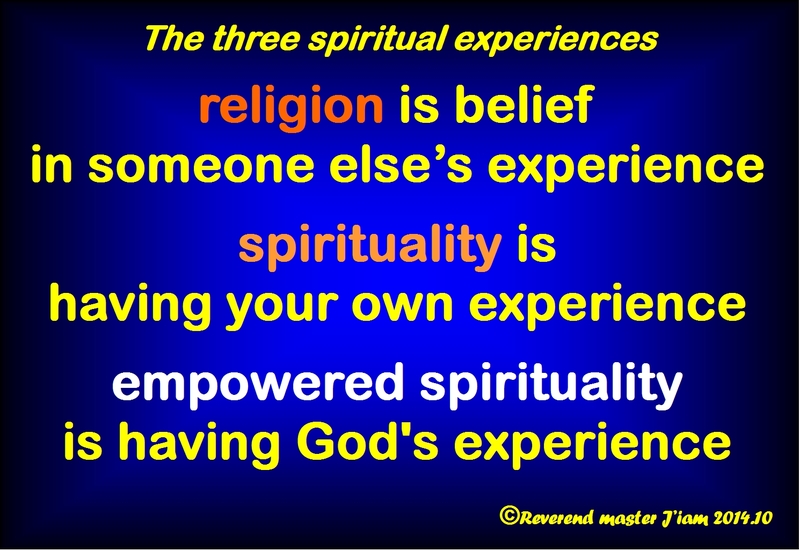 A lot of people think there is only one level in the spiritual realm, but there are definitely three. One of them we are denied access to (in this world for sure!) This is the top level, which is called, obviously, the Unknowable level. This is the Home of God, Allah, Jehovah, call him what you want – one name is as good as another, as the name is not for Him, but for us! One fold, is 2 to the power of 1 (2¹) = 2. Two fold, is 2 to the power of 2 (2²) = 4. I was reading a church commentary and the writer was using times and fold interchangeably. He had no concept of the huge difference in numbers! Thirty times is 60, whilst thirty fold is 1,073,741,824! Fifty times is 100, whilst fifty fold is 1,125,899,906,842,624. 1,267,650,600,228,229,401,496,703,205,376 is expressed in words as One nonillion, two hundred and sixty seven octillion, six hundred and fifty septillion, six hundred hexillion, two hundred and twenty eight pentillion, two hundred and twenty nine quadrillion, four hundred and one trillion, four hundred and ninety six billion, seven hundred and three million, two hundred and five thousand, three hundred and seventy six. Quite a large number, I’d say! And a fair bit bigger than 200! Lol! Sorry to take you down the maths road, but I hope it is interesting to you. The reason I am treading this road is to show you why people don’t normally see these numbers. The reason for this is that all three systems start with the two same numbers – 1 and 2! 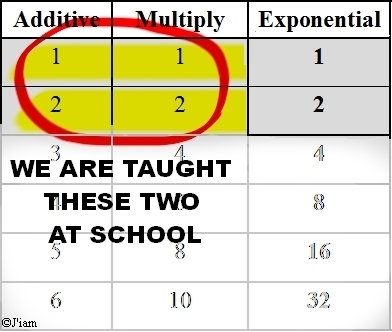 We are taught addition and multiplication at school at a young age, so whenever we see the sequence 1, 2 we automatically think “is that addition or multiplication?” We don’t even consider the third choice because most of us aren’t even aware that it exists! So the ignorant author continues on mistaking times for fold/exponential – you can see the amount of the errors, it is huge! Compared to the unknowable essence man is an ant compared to the infinite universe! Once we become empowered God’s energy is Added to ours! 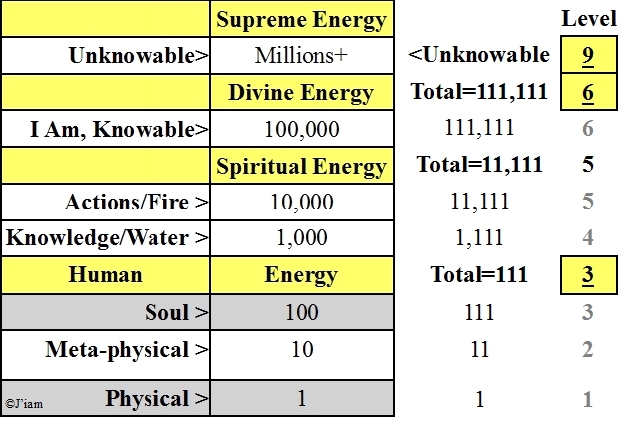 So as human beings we can reach an energy level of 111, but as empowered beings we can reach the first level of God (the water/knowledge level) which totals 1,111! We can then progress onto 11,111 by becoming “of the Fire” by manifesting Godly actions! That brings us to the end of the “spiritual energy” level. Again we can move up to the “divine energy” level. 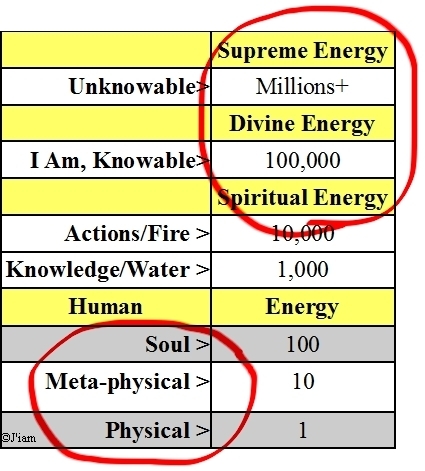 Here the energy starts at 100,000. so in this realm our energy starts at 111,1111. Notice how our human energy (111) added up equals 3 (1+1+1=3), whilst our empowered energy (111,111) equals 6. God‘s unknowable energy equals 9 and 9 is the actual number of this age! So from the start I was pegged as a servant and as an alpha male. I am not sure how the colour red fitted in. As I said, around 1990 I was asked to change my name to J’iam. I was even told how to spell it! So I investigated it for three months and then changed my name by deed poll. Along the way I was given another name as a “first name” – Mas. Mas is a Japanese name for a martial arts master. The reason I asked for a second name is because at the time a lady was in the papers trying to change her name to just “Rosemary” and the government was opposing it as it “Would leave a space in the name part of her passport and driving license!” Ridiculous really, but I didn’t want trouble with the authorities from the get go! Lol! So I changed my name to mas J’iam, and was very happy! Not so my “best friend!” When I told him I had changed my name to J’iam, he looked me in the eye and said, “I will never call you that!” and walked out the house and I’ve never seen him again! Lol! Although it is spelled j’iam it is actually pronounced Hi-am. This is because the letter J goes all the way back to Babylon to the bricklayers who used a HOD to carry bricks up ladders. A Hod is another extra hand and has come down into English as a hard J sound. English is one of the few languages where it in not pronounced as an H sound. I was told that the pronunciation of my new name was Hi-am. Jesus went into the desert and fasted for 40 days and nights (5.7 weeks, 5 weeks and 5 days!) He went in as Jesus the Master and came out as Jesus, the Christ, or Jesus, I Am! The secret of life for most people up to date, is that they have to go too the messenger and through the messenger to I Am, the source. My path was to the Source first and then back to the messengers of God! I was assigned to “The Glory of God”! Fortunately He recognises all the messengers of God and through Him I was able to study the spiritual messages of God from Adam onwards. I was with “The Glory of God” for 20 years before God himself told me to leave my Beloved Master’s faith! At first I thought it was just an evil thought, but He told me that I had a week to investigate it before taking the Holy Spirit off me! I know that nothing evil could do that. I investigated, but could see no “logical reason” why I would want to leave my Master. The day came around and I awoke to find myself spiritually dead! The Holy Spirit had been removed from me as promised! It was Awful!!! Within three days I had left my master and the Holy Spirit was retuned to me! That alone was the confirmation I needed! I saw that the transformation was a spiritual one, not a logical one! Reverend actually means “servant of the people.” SO my names in order of deed poll are J’iam, master, reverend – servant of God, servant of Man and servant of the people! Servant, servant, servant! Notice how it starts at the top and works down! I am not a church reverend, but a spiritual reverend. There is a big difference! I have been given the “Tenth Path” to bring people straight to the Holy Spirit. Know that the Holy spirit is as close as we can get to the “Unknown Essence” of God. That is because the holy spirit is the “Known essence” of God! We cannot proceed past this point within our live times. 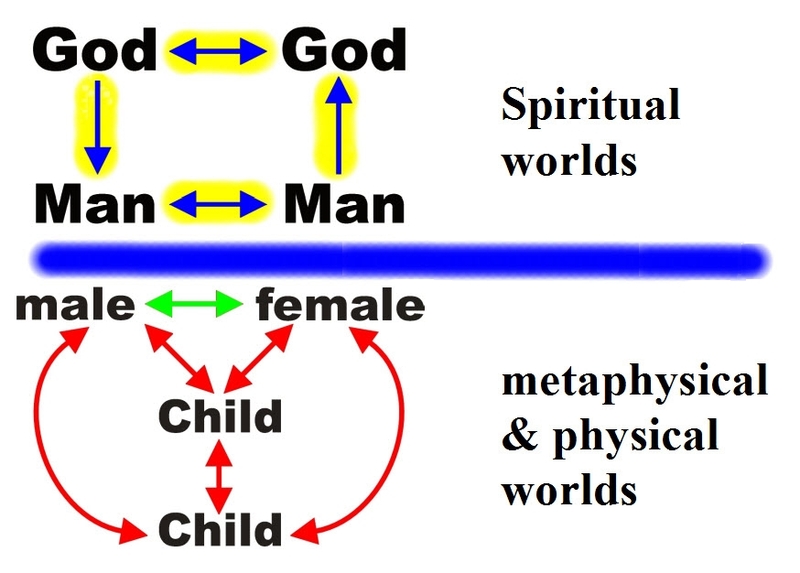 Man is a spiritual station that indicates both males and females are working on the metaphysical level! There is no sexuality in the station of Man. I have met many a Man who where physically female. It is only on the physical plane that there is the difference between male and female. And this difference is soley to do with reproduction of the species. I never use the words “man and woman”, using instead the neutral scientific terms of male and female. In the end I only left the religion of the “Glory of God” because God told me too – I am always divinely guided and protected! God’s order is not linear, but it is definitely spiritually logical! All my life I have been prepared for the upcoming 20 years – from 2015 to 2035! I was given my 30 year mission in 2006 (which I gladly accepted!) This means I will die again in 2936 (God never gives us a job without providing the tools, in my case time!) Now, the predictions are that world peace and prosperity will be in place by 2035; My job is to introduce world peace and prosperity through individual peace and prosperity! I got this in an epiphany in 1992, in the form of the Wholistic Peace and Prosperity Network (WPPN). I have been working on this since 1992. In 2006 I was offered WPPN as a thirty year mission, which I gladly accepted! So that is the story of my name and of most of my life. When the New Age System is complete in 2035 I will have a year to look at God’s handiwork and my service to God. Perhaps I will be honoured, given degrees and knighthoods. Those are simply physical glory things and not my aim in life. My aim in life is to spread God’s wonderful method of personal empowerment that is WPPN! God knows the answer to world peace and prosperity is on the cellular level – He has to make the peoples of the world healthy (permanently peaceful and prosperous) to make the body healthy! Man’s way is to put make up on the skin and pretend that the body is healthy! But anyone even glancing at the world today can tell that the kidneys, the guts, the lungs and heart are sick! It’s obvious to anyone who looks even a millimetre deeper deeper than skin deep! Working the Higher Laws Correctly like this is called “Invoking the token.” Working the token is actually working on a cellular/individual level, not a body/world level. That is because the time was never right until now. Notice how God created us a material abundance first before Gifting us a way to spiritual abundance! It takes two wings for a bird to fly! Without two wings a bird can only ever flop around in circles on the ground – sound familiar of today’s world? We have material abundance already and man has corrupted it by spending it on arms and tools of destruction and not sharing it with his brothers and sisters..
What we need now is a fair and equitable distribution system. WPPN is God’s distribution system on the cellular level! The Wholistic Peace and Prosperity Network works on three levels – Spiritual, Metaphysical and physical. It starts on the spiritual level and then works down. Why is this? Because the Spiritual level is the highest energy level of all. God always starts on His own level and works down! Doingness is the metaphysical way of working and havingness is the physical state of possessions. What is missing here? Why the spiritual state of “Be- ingness!” To be whole we have to BE, do and Have! Why do we have to Be? Because our Beingnes is our overall Happiness! Simple as that! Why do you thing the rich man approached His Holiness Jesus? He was seeking his Beingness/Happiness! I am sure Jesus laughed at the irony of him (the rich man) turning away and sighed at the tragedy of him being too attached to material possessions to receive the perfect answer he had been given. No man-made business has the Beingness part to it in a wholistic form. Wholeness is, of course, a form of God. We are made in the image of God and, therefore, we must manifest wholeness in this new age! I have always been a help to executives to help them solve both their own personal problems and their business problems (but that has always been an uphill battle because all the business problems have been a reflection of their internal/personal problems!) All people are reluctant to look to themselves for a solution to the problems they have caused – it is just the way of humanity, from the bottom to the top, on the physical level! Now, I am a messenger from God, talking from me to You on His behalf! Asking you to change your ways from the physical and metaphysical ways of humanity, to the spiritual ways of God. And offering you a brand new tool to help you achieve this goal – the Wholistic Peace and Prosperity Network (WPPN)! Know that the smallest is the same as the biggest. The atom is the same shape as the solar system! Man is made in the image of God! As within, so without! We are never “disconnected” from God, only unaware that He is working in our lives (even as an atheist!) Lol! I call to every open heart on earth to investigate this new system and come and join us to change the world by changing your internal world for the better. 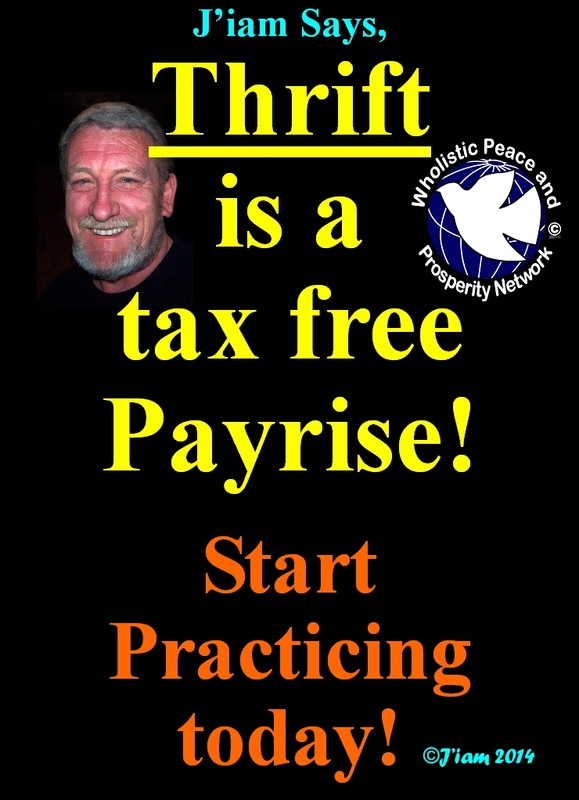 Thrift is a tax free payrise – start practicing thrift today! 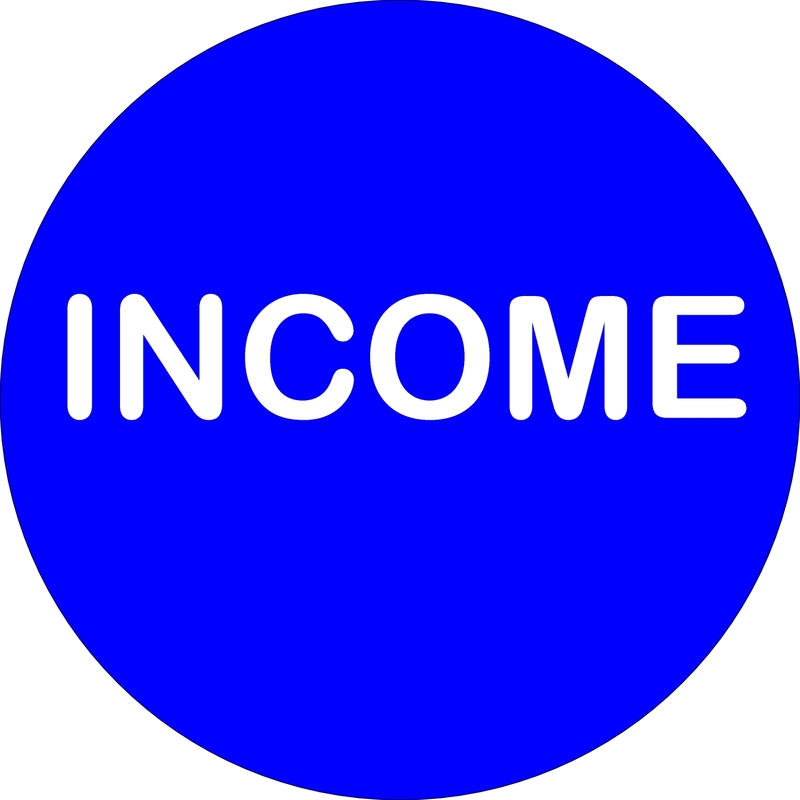 Thrift is a tax free payrise – start practicing thrift today! Thrift allows us to live at a higher level on the same amount of money or less! So if you have $100 worth of bills every week and you can reduce this down to $95 for the same goods and services, the effect is like a $5 payrise. Your $95 outgoing used to be $100, so your current $100 is now worth $105! Delve into this a little deeper and you will fins power in thrift! “thrift is half thy store” is a famous 7th century quote. Nothing has changed in 1300 years since, so thrift must be a spiritual power! And it is! Thrift is one of the steps to the spiritual state of Wealth! Wheeee! I’ve discovered the whole universe! The spiritual person says to the metaphysical…. There are many traps in life and the worst are those we are in and yet don’t even know that we are in them! I meet many people in my line of work and the worst are those who believe that they are awakened in God and yet are in a trap that keeps them from being awakened in God! I have asked God how to get people out of this trap and so far He has been showing me how they became trapped in the first place. Usually those in this trap follow a “master,” This master almost invariably teaches that all negative things come from God as “tests.” And the solution to these tests and pains are to absorb the pain and live with it. This takes no account of personal negative karma! If a soul cannot recognise their own personal returns from past negative actions and the master provides no relief from karma, then how can they be expected to recognise any test from God? Well, quite simply, they can’t! The masters who lead these souls are working on the metaphysical level, which is the level of the ego. Their messages may, or may not, be from God. One thing I have noticed about believers on this level is that they usually reject any written revelation from God, so they don’t have to test their lives against any kind of spiritual mirror. The trouble with living in the metaphysical world is that Karma (also known as the Law of sowing and reaping) is circular in motion. And it cannot be broken or controlled in the physical and metaphysical worlds. To break the karmic cycle we have to move up to the spiritual worlds! How do we do this? By simply asking out aloud to meet with God! This meeting is known as rebirth. Know that the moment you ask aloud, a whole series of “Coincidences” start happening, each one bringing you closer to that meeting with Him. And when you do meet God there is no way you can mistake it for anything else! You undergo a massive rebirth where you awaken with both eyes, ears and heart wide open! 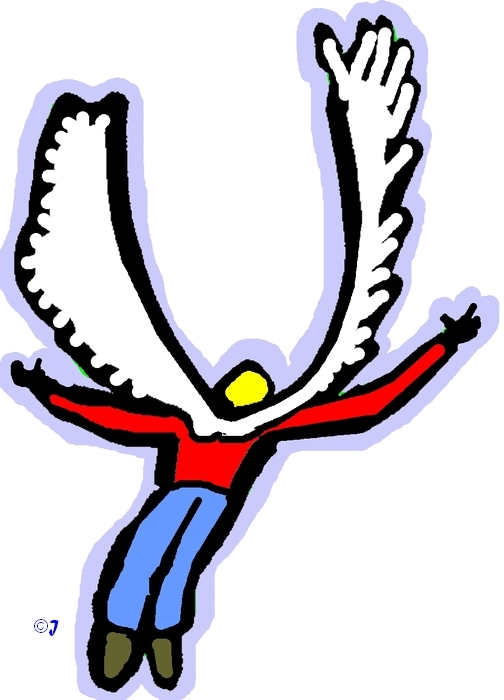 That is to say you are lifted from the physical and/or metaphysical planes to the spiritual planes in one sudden leap! Lol! 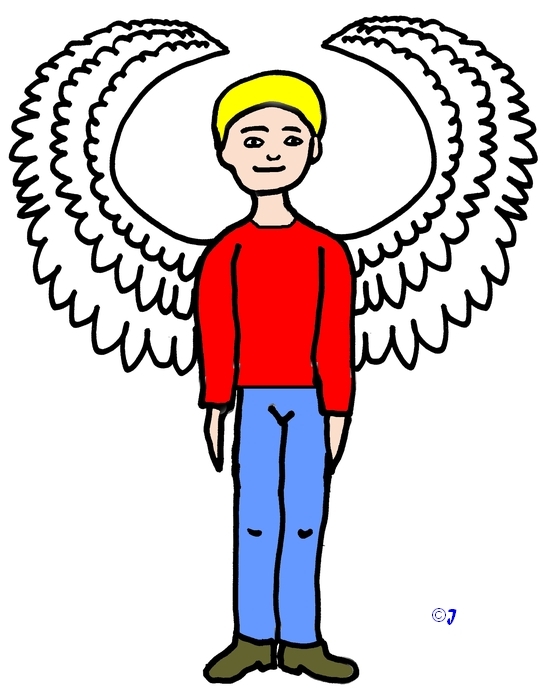 The first gift of the spiritual plane is the elimination of all karmic debts from the past. This is partially why it is called re-birth. We think we see the whole of God when we see the universe for the first time (this is a metaphysical experience), but the universe is just a pimple on God’s behind! One of the things that irks me is the metaphysical believers circular references to support their arguments – “I can see a facet of God, therefore I can see ALL of GOD! Therefore I don’t need to ask, because I already know Him! The reason it irks me is because I used the same circular arguments as an atheist for many years! Lol! It’s a bit like someone saying when their eyes are closed, “I can see the light through my eyelids, therefore I can see everything there is to see – I can see what you see!” Sorry buddy, you have to open both eyes to see what I see! Or looking at one facet of a diamond and pretending you can see every facet of the diamond! Or…. All of these circular thinking patterns are traps! Yes, thinking is circular on the spiritual level, but the circles are far bigger than just two! ”All things are involved in all things!” Most of the patterns in the spiritual world go 1 (the higher laws) 3, 5, 7, 9, 13, 19 etc. Circular thinking usually has a pattern of two. Also, physical thinking is linear, spiritual thinking is exponential. So there are huge differences between the mathematical foundations of the physical/metaphysical systems and the spiritual systems! Karma, which is a physical and metaphysical law has a pattern of two as well – sow and reap! It also has another double pattern within it– returns of positive and negative. Only spiritual law can change karma, as it reduces it to one aspect – positive returns only! This is because spiritual law over-rides metaphysical and physical law. In this case the laws of forgiveness over ride the laws of karma! By spiritual means we become free from negative karma! If we know that we have no karmic returns then we know that obstacles, or negative circumstances, in our lives are literally tests from God and we can set too and solve them! God always makes life simpler, easier for us! Lol! The WPPN (the Wholistic Peace and Prosperity Network)procedure is multi-layered. I am going to start from the absolute basics because you will either recognise it, because you have already achieved this level, or you will need to recognise it because you need to do it! The first stage is where we are internally disunited, which means our bodies, brain and soul are not united. A house divided as such can never win. A house internally united will always win! Then you will be “welded together” to complete your internal unity. And then the spiritual “Brain” awakens! This is when you see the power of God’s Higher laws! And you start to get the spiritual “Powers of Command”! At this very point you move spiritually from Water to Fire, from the Knowledge of God to the Actions of God! Once we show we have the actions of God as our Major Dominant Purpose in life we are promoted up to the level of an Angel on earth. And what we do with our abundance determines our true Wealth! Jesus had no need to be baptised by John the Baptist, but went through with it anyway simply because it was God’s bidding upon mankind! Even if we don’t want to do it we need to do it because we are beacons of light to the lost. If any of the beacons are missing it is easy for seekers to lose their way or to fall into holes! I don’t drink alcohol, although I used to before I was reborn (I was a whiskey “connoisseur”!) But it is a 1,300 year old command of God, and my will is submissive to the will of God, therefore I don’t drink alcohol! Only by being “Whole” can we achieve the stations of “Poor” and “Abundance.” This is why it is called the “Wholistic” Peace and Prosperity Network. Because it has the whole picture within it. If you have read this far and there is a fire burning within you, that is your soul telling you that this is the truth. Contact me and see the bigger picture, judge it for yourself and join to start the New Age process in your life and the life of your family, that you may Be uplifted Now! Join now whilst it’s still small and be way ahead of others at the due date of 2035 – when it will come into world-wide reality! There is a very definite and precise order to Love in the Universe. God, of course, created everything. So we have to ask, who does God Love first? The answer to this question is that God Loves God first! And who does God Love next. The answer is Man of course! “I loved thy creation, hence I created thee…” The act of creation is an act of Love! Why should God Love Man so? Because he created us in His image! Obviously the next step is the Love of Man for God! The fourth and final step in this love process is the Love of Man for Man. Notice how this is also a reciprocating Love, with love going both ways. This is because the station of Man is a spiritual station representing the awakened soul, who is, of course, a reflection of God! You will notice that I always spell this spiritual station of Man with a capital M.
So the first station in this portion of the universe, is the love of male for female and visa versa. 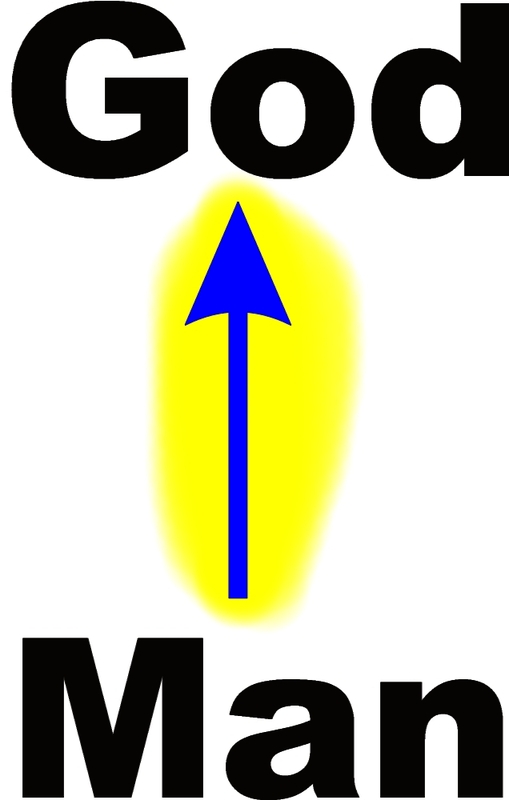 Notice how the arrow is a different colour (Green) to represent the sexual state of male and female. It only applies in this state and all the rest of the arrows in these lower worlds are coloured red to represent non-sexual love. 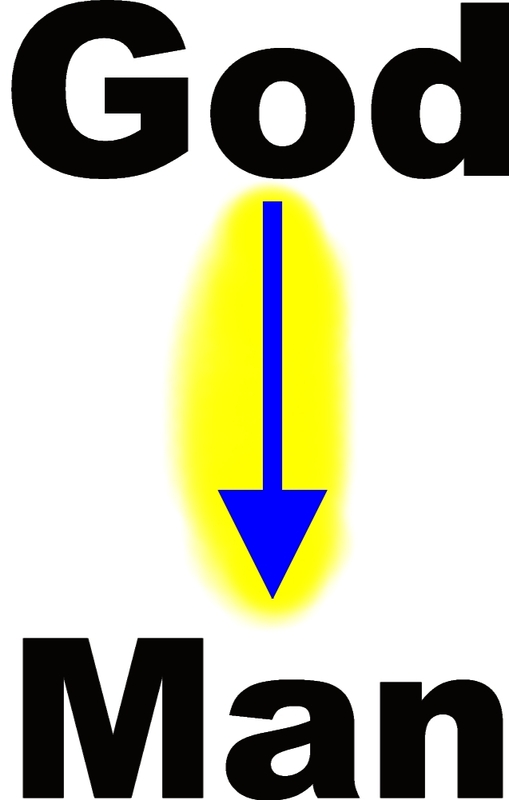 The spiritual blue arrows are also non-sexual. The sexual aspect only applies in the male/female state! The love of male for female represents sexual love, so that the couple can produce their own children and (hopefully) bring them up to be good and Godly adults who are a part of the divine civilisation. 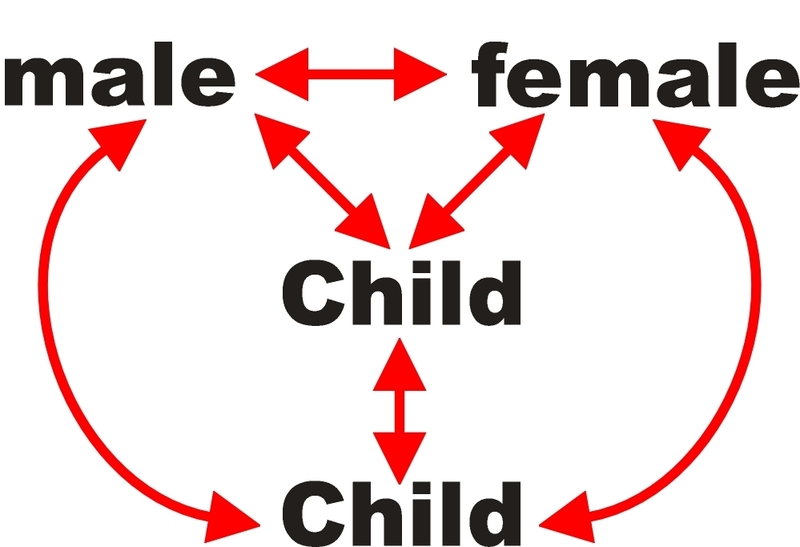 So the male and female become mother and father to their own children. We will just use a singular The love of male for female represents sexual love, so that the couple can produce their own children and (hopefully) bring them up to be good and Godly adults who are a part of the divine civilisation. So the male and female become mother and father to their own children. We will just use child singular to represent all children. 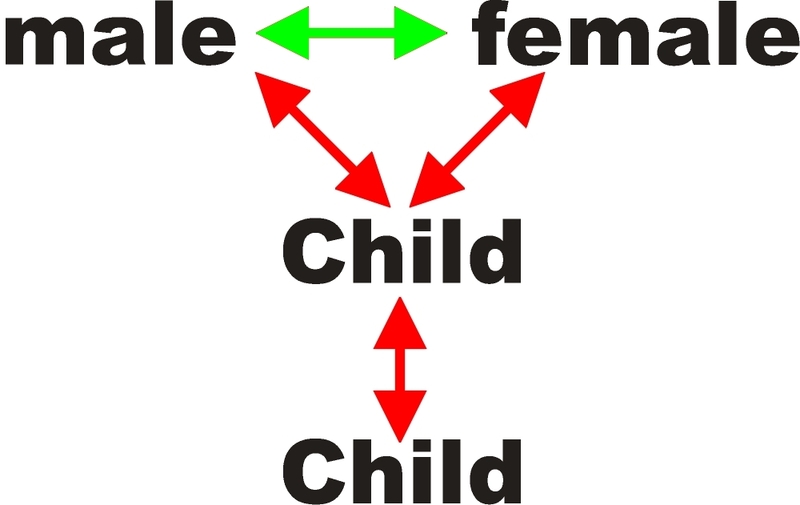 In the nuclear family we have a three way reciprocated love, a sexual love between the parents and a non-sexual love between the parents and child(ren). Our children grow up, leave home and marry someone and repeat the cycle. Unfortunately here we can strike a problem, because children always love their own children more than they love their parents. This is why the fifth commandment says, “Honour thy father and thy mother.” to compensate for this 20-30 year weakness in the human psyche. Fortunately, there is an upside to this, the children of our children have no children yet and their love is bounced back to the parents of the parents – the grandparents! Our real reward for our own children is always our grandchildren! By the time we have grandchildren we are old enough to move into the spiritual states of Matriarchy and Patriarchy. I will discuss these stations in another article. Well, some of us do and some don’t, it all depends on our spiritual awakedness! The blue separating line represents the barrier between the physical/metaphysical worlds and the spiritual worlds. We can only move from the two bottom worlds when we ASK to be awakened! To ask to be awakened is our primary purpose in life from the moment we are born until it is achieved! After achieving connection to God our purpose is to help build a divine civilisation (in two parts)! Living on margin means living on less than 100% of your income. As I said this is an “informal” budget. 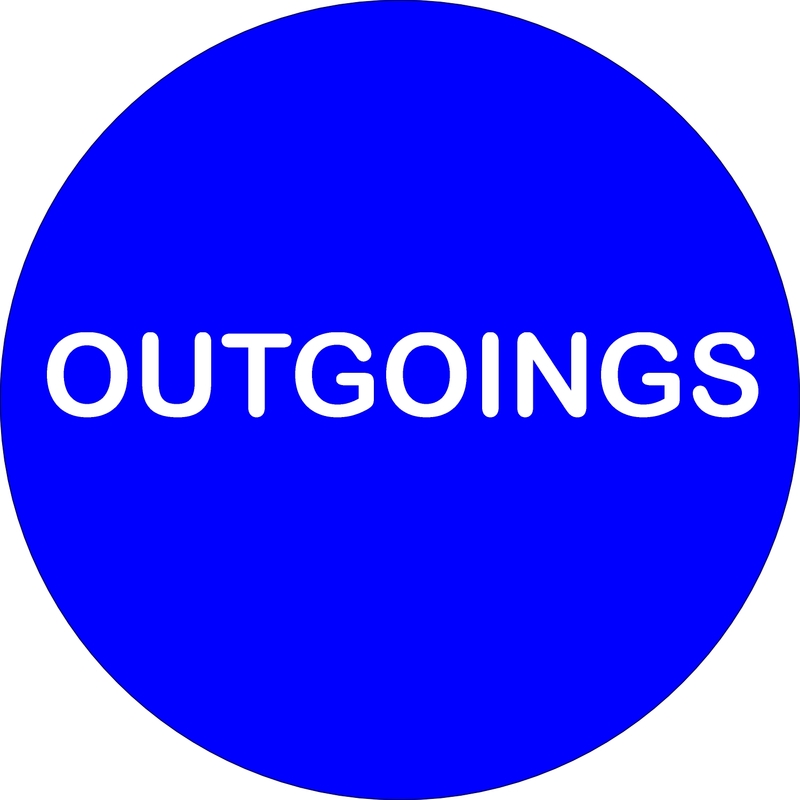 That is to say it is vaguely outlined into two simple factors of In and Out, but it is not a formal budget, that is to say an “Organised” Budget. The next step up in budgeting is to start organising your assets, which in the physical world means housing, saving and investments etc. This takes some organising and perhaps 20% of the population may have budgeting to a greater or lesser degree. These people tend to be a lot more financially viable than the rest of mankind, simply because the are organised. Know the difference between a man in poverty and a man in wealth comes down to one word – Organisation! 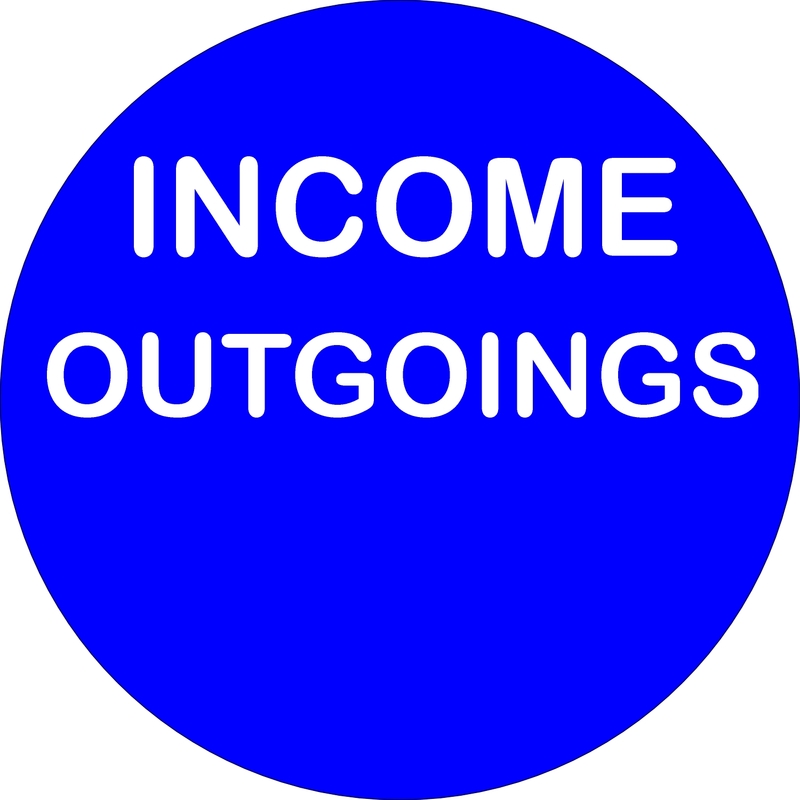 But there is a vary small percentage of people (perhaps one 10th of one percent) who organise their finances on a different level altogether. These people are “Spiritual” or “wholistic” budgeters. They end up as empowered people! This is because spiritual investors are working with energy levels of 1 on the physical plane and 100 on the Spiritual plane. So the two types of investments are 1/100 and 100/1 (one to one hundred and one hundred to one). Know that all spiritual processes are wholistic which is why so many fail in the spiritual realm, because they go for one favourite side of their spiritual life and ignore the other “Must Do” side! The 100/1 investments are called gifting to self, whilst the 1/100 investments are called gifting to others. These are the actions we must take to achieve the processes in our lives – Gifting to self and then gifting to others. It Must be done in this order! Both these investments set up what are called “Virtuous Cycles. ” Know that virtuous cycles are the keys to wealth which is simply Happiness plus Abundance. Notice how Happiness comes first. Why is this? Because “What profits the man who gains the earth and loses his soul?” What is the point of Being rich and miserable? None at all! Money amplifies what we are. If we are unhappy it amplifies our unhappiness. If we are happy it amplifies our happiness! The only type of happiness that is totally immune to money is Spiritual happiness! It is no harder to build Spiritual Happiness than it is to build physical happiness, only slower. Remember, physical happiness has an energy base of 1 whilst Spiritual happiness has an energy base of 100. On the physical route to riches all you have to do is invest money and reap it multiplied. This is called doing and having! But what is missing out of that formula? Beingness! To be Wealthy we have to Be, do and having takes care of itself automatically! So how do we achieve this sublime happiness? Jesus knew the answer very well – by becoming one of the Poor! Jesus said, and I quote “Blessed are the poor in spirit: for theirs is the kingdom of heaven!” [Matthew 5:3] Is not the kingdom of heaven the ultimate form of happiness? I have found it to be so. So the path to wealth is a two step process- first we become Poor (poor is a state of Beingness that has nothing to do with the amount you have in this new age). Whilst we are in the state of Poor we learn to work under the laws of providence which state, “Everything you need will be given to you either very cheap or free!” We have to learn how to work the laws of providence because they are the foundations of “The powers of command” which is God’s greatest gift! In the state of Poor we become free of the worries of the world and invest in virtuous cycles (100/1 and 1/100). It is the returns from those virtuous cycles that propel us into the next state which is called abundance. The law of abundance states. “You can have anything you want but there is a price to pay!” What is the price we have to pay? We have to fulfill our Beingness! And we can only do that by achieving the state of Poor. The “state” of poverty is actually a state of lack – like darkness is a state of “the lack of light.” Darkness cannot exist in the presence of light – it is as simple as that. So the state of Poor is the first state of light that throws out the darkness of both poverty and riches by illuminating every corner! Did you know that riches are a state of poverty? They are, because they are gained simply by doing and having. Poverty is gained by not doing and not having! Where is the Beingness in either of the two dis-empowered states? It’s not there! Which is why they are states of darkness. Beingness is an empowered state. The word em-powered means “Power from without” Literally powered by God! The state of Poor is the first state of empowerment. Once we achieve the state of Poor by investing in the two spiritual assets (virtuous cycles) we are literally on our way to abundance. Once we attain abundance and handle it properly we can achieve a state called Wealth! Wealth is the highest state of all as it is a synergisation of both Poor, Abundance and the Powers of Command, where the sum of the parts is greater than the sum of the whole. Why am I explaining all these things? Because you can’t just head out on a journey not knowing your destination! If you don’t know what your destination is you are just going for a Sunday drive! Or as they say in motivation circles, “If you don’t change where you’re heading, you’ll end up where you’re going!” For most people heading out they are heading towards the cliffs! I repeat, your true destination in life is Wealth, which is achieved by attaining the state of Poor first and then the state of Abundance! This article about living on margin is the beginning of your journey. Without living on margin you’ll never even leave your home driveway! So back to spiritual investing. When we start we have to allocate some money to two types of gifting. The first, and most important type, is Gifting to yourself. This is not in the least egotistical and is the most Spiritual type of gifting there is! Why is this? Because you are gifting to your own Godhead! Which is why we always pay ourselves first. The correct way to pay ourselves is to create a family bank that will last a thousand years. This is because when we die our souls survive (Soul = Beingness) whilst our brains and body are annihilated and spread back over the earth. Death is the final destination of us all in this world! The only thing we can take with us into the next world is the Love we create in this world. To become abundant we have to learn to Love money as a spiritual tool. The state of Poor detaches us from money as a “Commodity.” It is the collecting of money as a commodity that leads to the disempowered state of “riches.” What does the rich man take to the next world – very little because he has spent his time on accumulating stagnant money instead of Living Love. Those of us who accumulate living love on earth take every bit of it with us and if we have built a “Spiritual” family bank, we leave that behind us as an entity to help our spiritual family and the world for many generations to come! I dare say that will be taken into account in our life’s summing up in the next world! Lol! Heaven is Being close to God in this world and the next! Hell is not a place – it is simply being far from God in both worlds. Thanks for reading this, more exciting news to come tomorrow! Faith without Deeds is Dead! Faith without Deeds is Dead, therefore only Faith with Deeds is alive! In this new Age do you think God’s Love for us has shrunk or expanded? Look at the constant flow of miracles we experience every day! God Loves us even more openly in this New Age, the greatest of all ages so far! He wants to look after all our Needs! All of them! Why is this? Because God is Whole, not partial. And we live in the first new age of wholism! In this new age it doesn’t just include our spiritual growth, but also includes work, income and housing! This is the first time in the history of Man that this has happened! In this New Age God has expanded His care on earth from the spiritual to include the physical and the metaphysical. The physical was manifested in the industrial revolution, the metaphysical in the computer revolution and now He is to manifest the new spiritual order in the current happening revolution – which will Be in place by 2035! This is why the churches are losing their power because they only deal with the spiritual and the New Age is Wholistic! By the time they wake up it will be too late for them. Why have we been gifted these countless miracles? Because Man has reached a state of spiritual maturity at last! Do you think God has showered us with abundance in this new age so we can simply destroy ourselves? No! He has showered us with abundance that we may create a Divine Civilisation – “The like of which Mankind has never seen before!” So this is a complete spiritual revolution! As with all revolutions the rules change. In the coming Divine Civilisation the rule will be with spiritually mature peoples of the earth – because the spiritually mature will own the assets of the earth, not the politicians, the rich, the usurers and the corrupt. Only by each of us owning all our assets forever (and passing them down through the generations) can we ensure everlasting Peace. Peace can only be obtained when the prosperity of the world is denied to the usurers and passed onto the people. Only the spiritually mature people can create their own Prosperity! How do we create Prosperity? By creating Virtuous Cycles in our lives – first one, then two then many! How do we create virtuous cycles? By obeying and actioning the 11th commandment! What is rte simplest way of doing this? By joining WPPN (the Wholistic Peace and Prosperity Network) and training in this system – which was revealed to me by God in 1992! It is extremely difficult to set up a wholistic Virtuous cycle by ourselves. I mean, God revealed it to me and it still took 19 years for me to understand the gift I had been given and to set it up to succeed in my life! Much better to join WPPN and follow the simple step by step processes. It is extremely hard to set up perpetual spiritual, metaphysical and physical written goals by ourselves. So God has revealed to me a book called Commitments which are all the goals you’ll ever need to create your own success and a spiritual divine civilisation. Where can you buy this book? Well, you can’t – it is only available to members (for free) when they join! I know if I was a capitalist I could sell this book for many thousands of dollars per copy. But I am not a capitalist (capitalism is dying now) and I am a missionary. To be a capitalist you have to be willing to take advantage of peoples natures. To Be a missionary you have to want to change peoples behaviours for the better! I am a missionary with a 30 year mission that ends in 2036 at the age of 85. 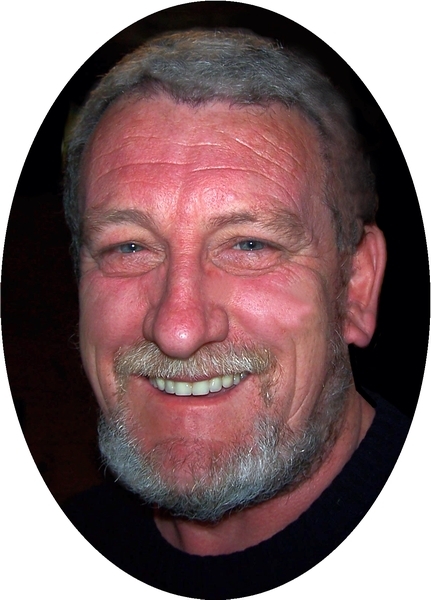 So where other people retire at 65 I am just starting my final 21 years! We live in exciting times. 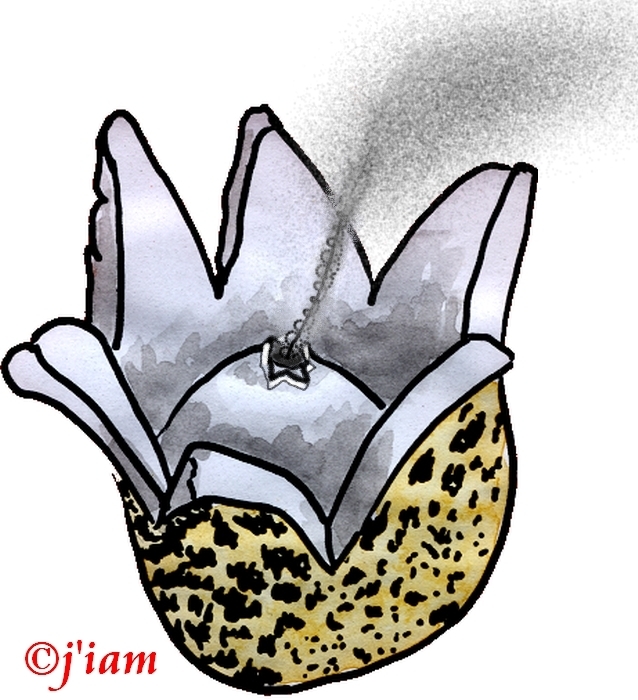 On the surface it seems as if the world is in a state of decay and corruption – which it is! Most of us can only see the big trees decaying and falling. People are going around shouting and screaming, “The old trees are crumbling – we are doomed!” But they forget that God is always recreating the earth every second of the day! If they would just stop looking at the falling trees and look down to the bases of the trees, they’d see new living trees ready to spring up when the old tree actually does fall! One of these new, small trees at the base is WPPN! So far our small tree has a core of three members – a 300% gain from the start of it. I call out, in the Name of God, to the world for new members that we may reach 100 members when it will start to arise (grow) in the world. From 100 we will expand to 1,000 when it will become a permanent fixture in the world. From 1,000 it will rapidly grow to 10,000 and 100,000 and we will start to be studied by the press. From there things will rapidly evolve so that we (the people) become a world energy of God and the new Age! Come and join us. Investigate the Wholistic Peace and Prosperity Network to judge it’s truth and, when you find it to Be true, have the courage to commit to yourself first, to God and to the network. Think about number three first – just what is em-powered? It literally means powered from without. Our own spiritual experiences are powered from within. Empowered spirituality is powered from without. Powered by who? God of course! It is far too easy to mistake the phenomena of personal spiritual experience with the reality of empowered spirituality! The empowered state is like becoming a perfect mirror that reflects God in most ways. Imaging that the mirror is aimed at the sun. You would see the sun shining and brilliant in the mirror. But the real sun is always inaccessible. Spiritually this is called the unknowable essence. The light we see from the sun is only a trillionth of the suns real power. But if that sun reflected in a perfect mirror we would be unable to tell them apart visually. It is only by putting our hand on the perfect reflection we could tell it isn’t the real sun! For the real sun burns at millions of degrees! But the perfect reflection is touchable. So it is with God. God’s real fire is the power of creating Life and the power of Justice. But in every other aspect we are the same as God! We can create everything except life and we cannot handle true justice. Which is why, for Man, forgiveness is the ultimate form of revenge! Because it puts us back into Love and hands the perpetrator back to God for justice! And I’ve seen quite a few laid low from this justice! Where can they go to hide from it? Nowhere at all! I know of a few people who believe they are in the empowered state who are actually blinded by their own spirituality. Remember there are two glass ceilings in life – The first glass ceiling is, of course, the barrier that keeps us from our own spirituality. This barrier is commonly called materialism. Then our introduction into our own spiritual experiences presents us with the second glass ceiling, mostly because we believe that the second step IS the whole answer, Sorry it’s the first step in a two part spiritual experience! The only way to come to the second state is to ask for it – ask out aloud. You can also empower the asking a hundredfold by making it a written goal. The asking is the power of the spoken word (sound) and the goal is the power of the written word (Light)! If you want guidance to the second state of spirituality i can help you achieve it fairly easily.